Wilton Lights is a Christmas Light display in Wilton, Maine, put together by the Hilton Family and InterFix Communications. The lights are animated by computer and synchronized with music. The music can be heard by tuning your car radio to 96.9 FM when you are nearby. Preparation for the display begins as soon as the after Christmas sales start the previous year and continues through the summer. The animation sequence programming is done throughout the year. This is truly a family project which requires a lot of careful planning. When everything is turned on at once the display draws around 35 amps of power and runs off of 3 different circuit breakers, which isn’t much relative to what it was before we changed most display elements to LEDs. The 22 foot tall “mega-tree” consists of 5,952 lights (1,984 RGB – Red, Green, & Blue – LEDs) and can draw up to 117 amps (12v DC) in total. The star on the top of that tree adds another 300 lights (100 RGB LEDs). There are nine 5 foot tall wire trees with 350 traditional incandescent lights each. These are the some of the oldest items in the display and run off of normal AC power. The 4 arches add another 2088 lights (696 RGB LEDs). Every light in the display is sent an intensity value (roughly 280,000 points of data for the whole display) 40 times per second. These instructions are sent out from a Raspberry Pi micro computer in the house via 6 gigabit network switches and approx 500 ft of ethernet cable. The display is scheduled to run from 5 to 9:30 PM until January 1st, starting as soon as it’s up and running (check our home page or Facebook Page for the latest details on that). 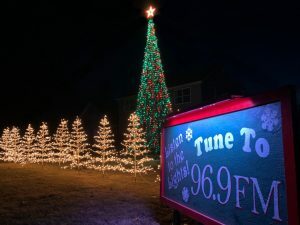 You can find the display at 38 Applegate Lane in Wilton – just a couple miles off of routes 2 and 4 up Orchard Drive. Please approach from Applewood (Go past Applegate when coming from Wilton, turn left on to Applewood, then left again on the Applegate) to make sure you’re on the right side of the road. You can find directions at Google Maps.